The 73rd China Educational Equipment Exhibition was over with a perfect ending after 3 days of activities. During the event, INTECH unveiled the latest products, smart academic library solutions, smart campus IoT solutions along with interactive whiteboard. With the actual experience of these products, visitors gave the unbiased, high score on INTECH products. There are people mountain people sea in the sample area of INTECH 24h Self-service Library, as visitors are curious about how this solution made the library a more accessible and desirable attraction. Security Gate – visitors took books without checkout resulting in a sound and visual alarm, which proved to be the great answer to anti-theft in library. Another sample area of INTECH Smart Campus IoT Solutions also attracted a large number of visitors. With the guidance of our colleagues, visitors had a comprehensive idea on the INTECH Smart Campus IoT System by reading its topological diagram as well as watching the four monitors. The system allows faculties or administrators to remote surveillance every corner of school and remote control the equipment like lights, air conditioners and so on. It absolutely automates your school facilities while conserving energy, increasing security, reducing overall cost. In this event, visitors highly appreciated INTECH’s products, especially smart academic library solutions, smart campus IoT solutions. We got a lot of positive feedback. For example, smart mini library give readers much convenience so that they can check in and check out at any locations and any times; the self service kiosk extremely simplifies the library transaction process, in consequence, readers no longer spend much time on queue; smart shelves streamlines the inventory counts resulting in exceedingly efficient library management and permitting librarians to relieving stress from cumbersome tasks to do more interaction with readers; smart campus IoT solutions contain various subsystems, like multimedia management system, broadcasting system, intelligent lighting System, environmental sensing & control system, etc. which is as simple as unify to all of campus operations on a single platform. 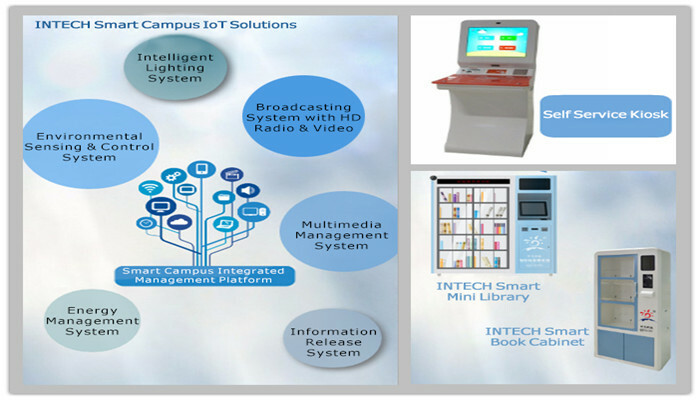 Students, faculty, and administration will be well-served by smart campus IoT solution as well as smart academic library solution from INTECH, which will make your school safer and smarter than ever.